Last night, I had a client dinner at Kin Khao restaurant in San Francisco which I’ve been wanting to try for some time. The place is so popular that they only seat you if your full party has arrived. In fact, they were on the brink of giving up our 6pm reservation at 6:22pm because someone was late! The Michelin-starred hot spot did not disappoint: caramelized pork belly, charred Monterey Bay squid and braised beef cheeks in curry. 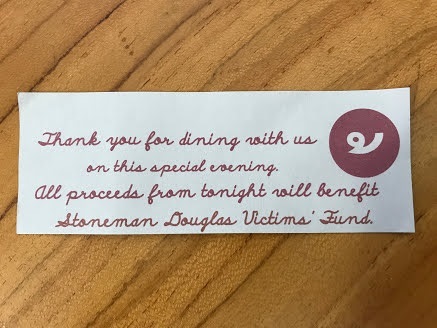 When we got our bill, we received this message that all of the night’s proceeds would be donated to the victims of the Marjory Stoneman Douglas high school shooting. Thank you, Kin Khao. I will be back! And thank you to all the small businesses who give back and support our communities. Bravo. I would definitely be returning, too for the food sounded delicious and love that they also give back to such a worthy cause, as well! What a class act. Seriously warms the heart. And makes me miss great SF restaurants!